Input, Output and DC Power Jacks are located on the top to preserve maximum pedalboard space. All too many high-gain distortions accomplish their sound at the expense of dynamics and transparency. Excessive compression and a pile of filters leaves the user with a sterile and unresponsive playing experience. Our Double Edged circuit was an exercise in tonal simplicity and refined selection. In order to accentuate dynamics and transparency, every effort was made to avoid over-processing. The Double Edge contains only one filter and very carefully selected op-amp circuitry to ensure an open and organic sound that is truly rare in the world of high-gain pedals. This highly responsive circuit is extremely capable, yet awaits your orders for destruction. At your wish it can be tamed without hesitation with your guitar’s volume knob. Once this stand-out tone was created we then set out to match the sonic versatility of the Double Edged with equally adaptable controls. Our Volume Knob controls the overall level of the pedal. The headroom of the Double Edged is immense and the Volume knob can adjust this headroom with a smooth and even response. Its location in the upper row protects it from accidental adjustment. The Tone Knob offers a wide frequency sweep that allows for a huge selection of tonal qualities but every effort was made to ensure that the associated filter was wide enough to prevent narrowing guitar tone. Both channels share the same Volume and Tone Knob but their voicings within are unique. Gain 1 is voiced for rhythm with a fat and crunchy medium gain distortion. At its lowest settings it can be used to push a fairly clean amp over the edge or take a slightly driven amp to the next level. At high settings a clean amp can be driven to a convincing drive tone that preserves every detail of chordal and arpeggiated parts. Gain 2 has more gain, a slight volume boost and is voiced for lead solo tone and singing sustain. This channel can be used as a transformative tool for clean amps, taking them to a new world of gain in a very natural and amp-like way. With medium gain settings on the amp, the Gain 2 channel takes a lead tone to full saturation. Thick and pronounced lead tones come out naturally instead of sounding forced. In a high gain amp setting, this second channel will push into that burning amp / melt-down territory that will expand lead “parts beyond what can be accessed by simple ” dirt pedal. To make these channels most accessible, both channels are silently switched via the dedicated Gain 1/2 Footswitch. Input, Output and DC Power Jacks are located on the top to preserve maximum pedalboard space. We’ve also added an Direct Out which can be used for many purposes including re-amping or as a tuner output. 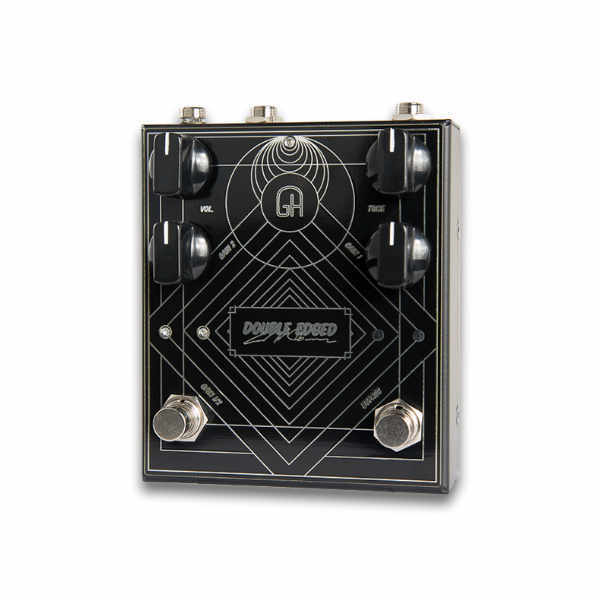 The Double Edged is a new offering on an organic high-gain tone with a versatility that will prove useful throughout the gain settings of your performance.